Joey Mills was diagnosed with hearing loss within the first month of his life. It was discovered he had heart and spine defects that were diagnosed while still in the Neonatal Intensive Care Unit. Since the heart, spine and ears all form during the same time in a pregnancy it was recommended that he have a hearing test. At that time, hearing tests for an infant were difficult and often inaccurate. The child was held with a headphone over one or both ears in a sound booth and noises of varying frequencies are transmitted to the headphones, an observer watches the child’s eyes and body for physical reactions to the noises, and decipher whether the reaction was voluntary or involuntary. As the child grows the testing becomes more accurate, but a baseline could be established in a very young child. Hearing testing has become so easy and advanced since Joey’s hearing loss was diagnosed that every newborn in every state is supposed to be screened before leaving the hospital. 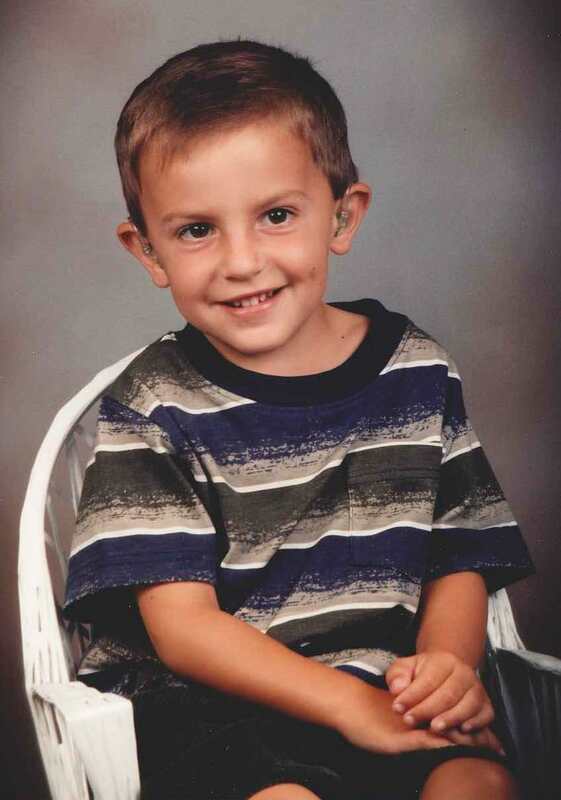 Joey was fitted for his first hearing aids at three months old. Parents of a child with hearing loss are encouraged to talk to them non-stop to promote speech development. There are two schools of thought in teaching children with hearing loss: begin sign language right away for the entire family or intensive speech therapy. Joey received intensive speech therapy from Joan Hewitt, whom he saw regularly until he was four years old. Joan taught Joey speech and listening skills that were absolutely critical to his language development. At age four he entered a pre-school for children with hearing loss, Children’s Choice for Hearing and Talking (CCHAT), which was affiliated with Project Talk. They used music therapy, private speech therapy, and small group discussions to create a language rich learning environment for the children. Joey’s language skills grew immensely thanks to Project Talk, and he was ready to be placed in a mainstream kindergarten class with his peers. At Elementary school Joey thrived in a large group environment with the aid of weekly speech therapy sessions and the use of an FM system. The teachers wore a microphone which allowed them to speak directly into his hearing aids, and eliminated the issue of background noise. The system did have its draw backs as Joey often couldn’t hear what other students were saying in response to a question by the teacher, but many teachers learned to repeat the response so he would be a part of the discussion. Joey continued in speech therapy, and using the FM system in school through the 8th grade. When Joey was 13 he was referred to Dr. Rick Friedman, currently Division Director of Otology, Neurotology, and Skull Base Surgery at Keck Medicine of USC, who upon reviewing an MRI of his ears believed he could restore Joey’s hearing with surgery. That summer Joey had surgery on his left ear, which was a huge success and almost completely restored his hearing. The following summer, he had surgery on his right ear which restored enough hearing so that he no longer needed hearing aids in either ear. As you can imagine this was a life changing event for Joey and our family and we will forever be grateful to Dr. Friedman. Joey is now 23 years old and works as a Credit Analyst and is also a licensed Real Estate Agent. He lives in Newport Beach and enjoys trading stocks, working out, and boating with his family on Lake Mead. When you live with someone who has hearing loss you learn that there is wonder and development in the smallest things. When Joey was three years old hearing aid technology continued to improve and he received his first pair of digital hearing aids. One day when he was playing under a tree, he looked up and saw a bird. He looked up because he heard a noise, a noise that he had never heard before, the birds were singing. The Mills Auditory Foundation is dedicated to improving the wonder and development of those with hearing loss.